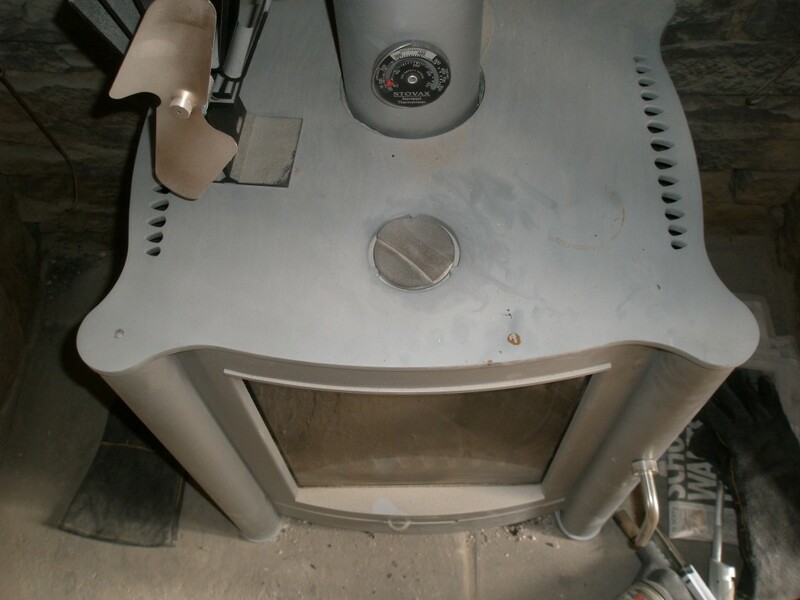 Anyone who has owned a log stove will be aware of the problems of the stove glass sooting up. Some stoves seem worse than others, but it is something that all stoves do over a period of time. Not enough air: This leads to poor combustion and smoke. This will eventually blacken the glass. Make sure the fire is burning hot enough. We have a Stovax flue thermometer that shows the optimum temperature for the flue. This ensures that the exhaust products from the fire reach the right temperature to be burnt off. They cost about £10 and are a good investment. All of the above works really well with our Firebelly FB1. We seem to be able to burn just about anything on it (we never put treated or painted wood on the fire) and it never soots up. The Spartherm unit (Arte 3RL) is a different story. Despite only putting kiln dried wood onto the fire, it always seems to soot up. The Spartherm glass goes black all over. While some sooting up is inevitable, this seems to happen within 1-2 hours. There is only one control on the front. This controls the air flow from underneath. There seems to be little control of the flow from above. There is also no opportunity to view the temperature, so it is difficult to tell whether it is hot enough. We wrote to the manufacturer. Their response was to send us the manual that we already had (the same one that was supplied with the unit). We have found the easiest way to clean it is using Stovax clear glass cleaner, but it soots up so quickly, we really avoid using it too much. It is shame since it is a nice looking unit. But we have better things to do that clean the glass everyday. The Firebelly unit is a completely different story. We have used it continually and have only had to resort to cleaning it once a month. And that is often just to take the odd black soot mark off the glass. It takes all of 5 minutes. 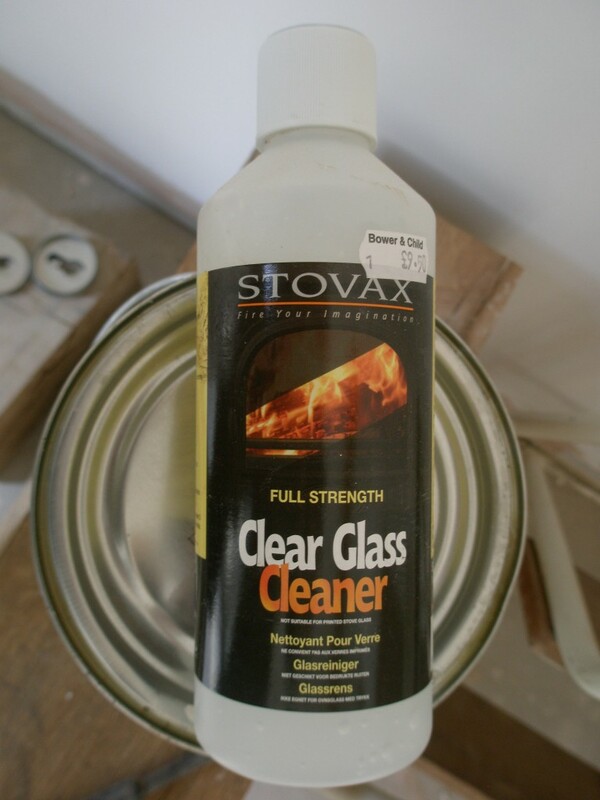 Stovax glass cleaner. This works a treat. It is caustic so be careful when you use it. It says to apply it liberally and leave it for 5 minutes before removing with a damp cloth. I use it sparingly and clean off within a minute or so. It is expensive, but you don’t need to use much of it. A rather dusty Firebelly FB1 showing the top vent and the bottom vent control (the “U” shape poking out from the door underneath the glass pane). You can also see the Stovax flue thermometer in place too. We always leave this slightly open. 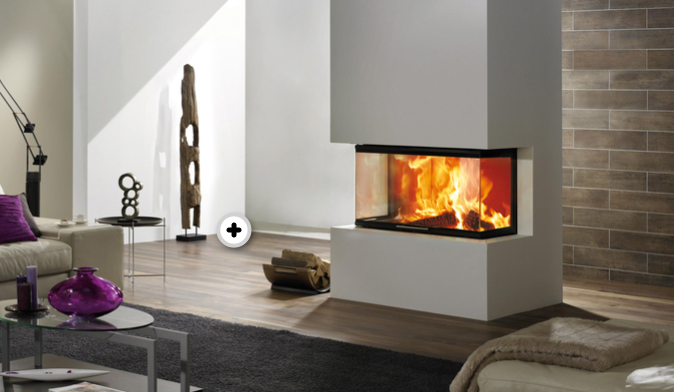 It provices air to the top of the fire – exactly what logs need. We fully close it and then open 3/4 of a turn. We only adjust the bottom vent. While the glass does soot up very quickly (within a matter of 1-2 hours), the soot does clean off easily with Stovax glass cleaner. 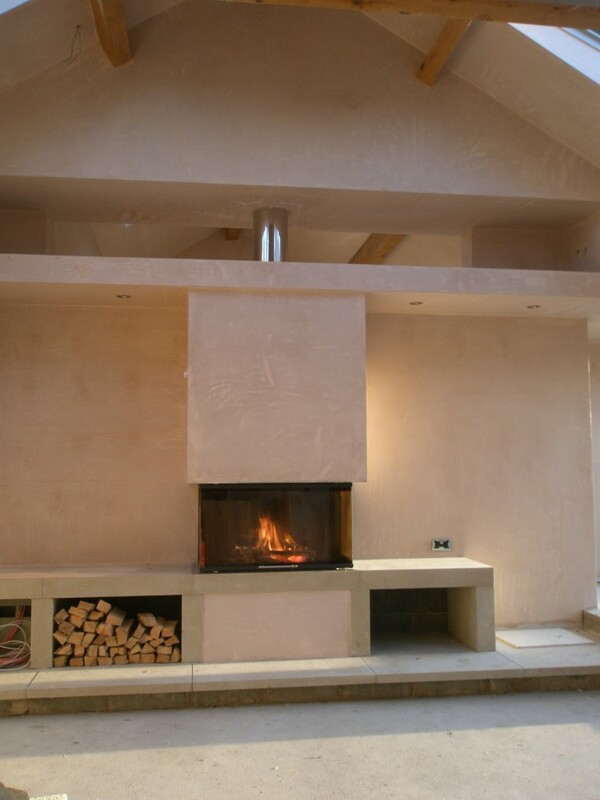 The new fireplace (based on a Spartherm Arte 3RL 100H fire insert) was plastered last week. The plaster has dried out over the weekend and we expect to get the lounge decorated this week (with a bit of luck). We have had the fire on today as the ground source heat pump still isn’t working! 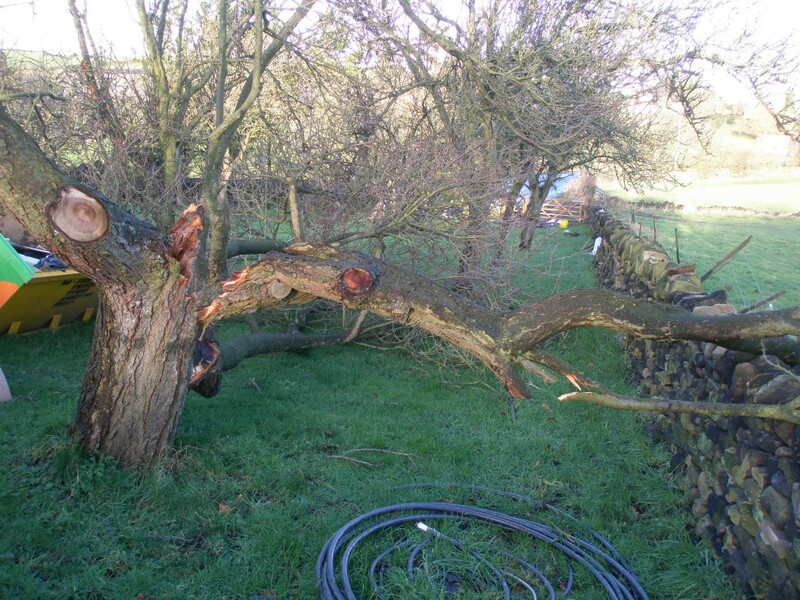 Nibe (the manufacturer of the heat pump) are due out on Wednesday, but in the meantime we have no heating or hot water. 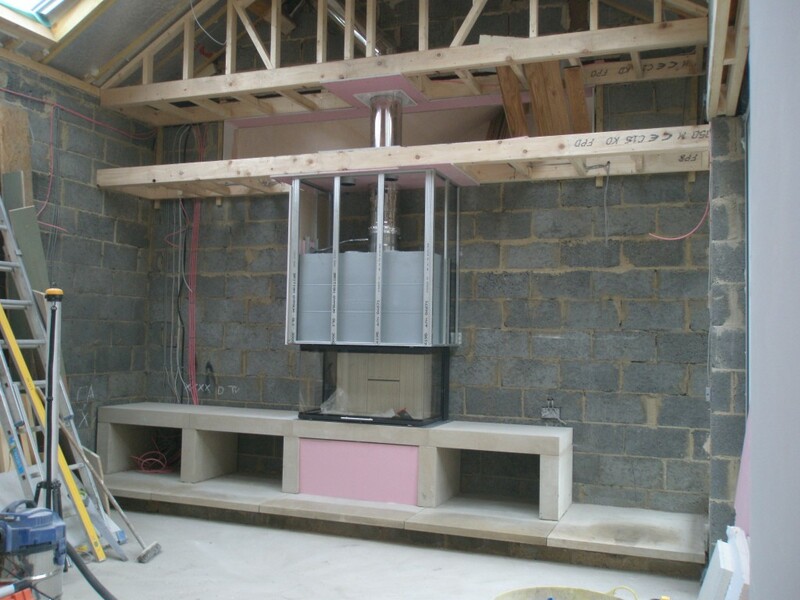 We have pushed ahead with the fire place in the lounge and, by the end of the day, we are ready to fit the plasterboards on the metal framework. 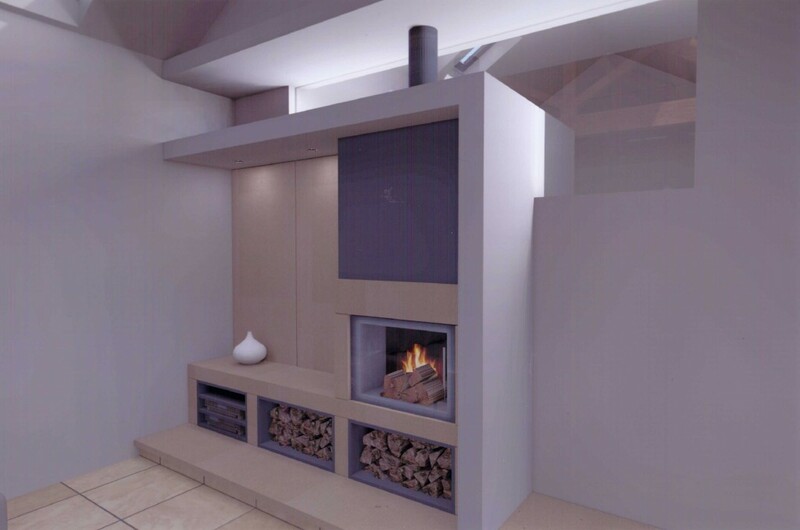 Even without the plasterboards on, the fireplace is usable. I can’t wait to see it in action. 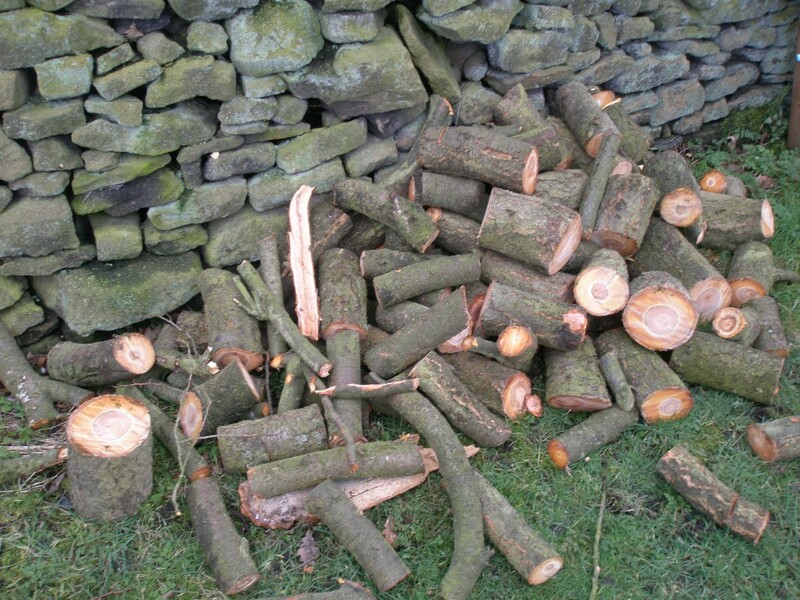 We even had a fresh delivery of kiln dried logs yesterday! This metal work is the same that we have been using to dri-line the solid walls in the older part of the property. Fortunately, we had some left over. The framework will be covered in fire line board (a pink coloured board that is more heat resistant than normal plasterboard). Another view inside the chimney breast. The large stainless pipe at the rear is a 10 inch flue (it has an internal diameter of 8 nches). 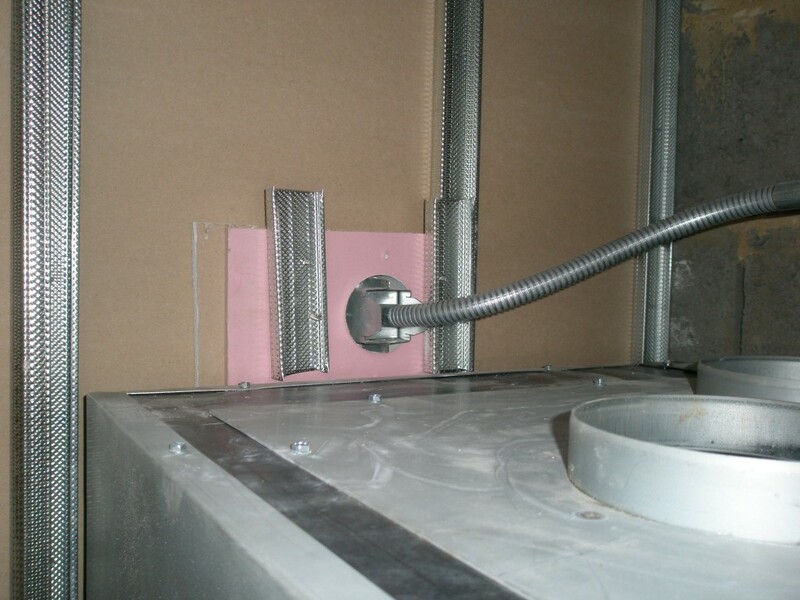 The two pipes in front of the flue are to vent the heat that might build up inside the chimney breast. The heat will rise out of these pipes and into the lounge. Here’s the inside of the chimney breast. 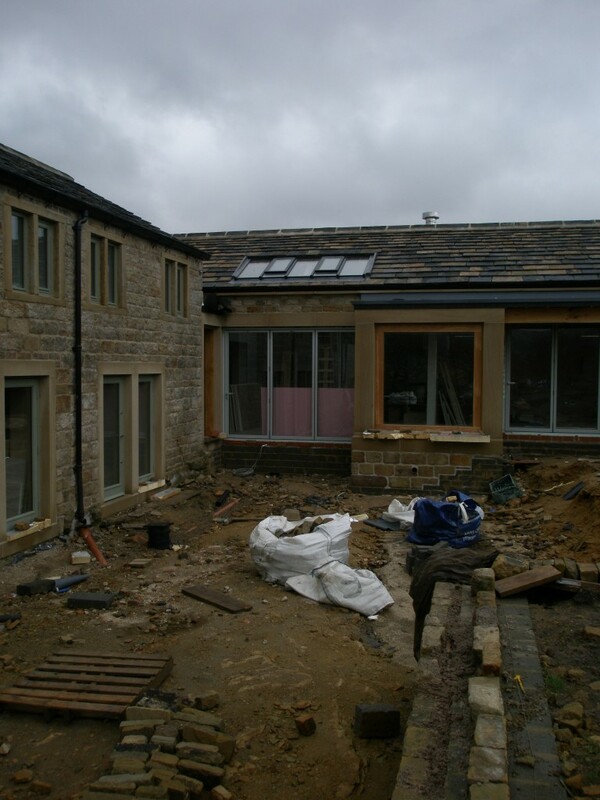 It has been formed using the same metal work that we have used to dri-lining the solid stone walls. The metal work is then boarded using fire line board – a type of plasterboard that is more heat resistant than “normal” plasterboard. The control you can see here is for the butterfly (an internal baffle) in the flue that controls the amount of air that exits through the chimney. The rest of the fire line boards will be put on by the plasterers when then get around to plastering the lounge. The fire line board will then be plastered in the same way as the rest of the walls. We should get to plaster the lounge during next week. We have made some more progress with the fireplace today. With the wet weather, we have been looking for indoor activities and finishing off the fireplace was one of our top priorities. All of the pieces of ashlar that form the fireplace are now in position. 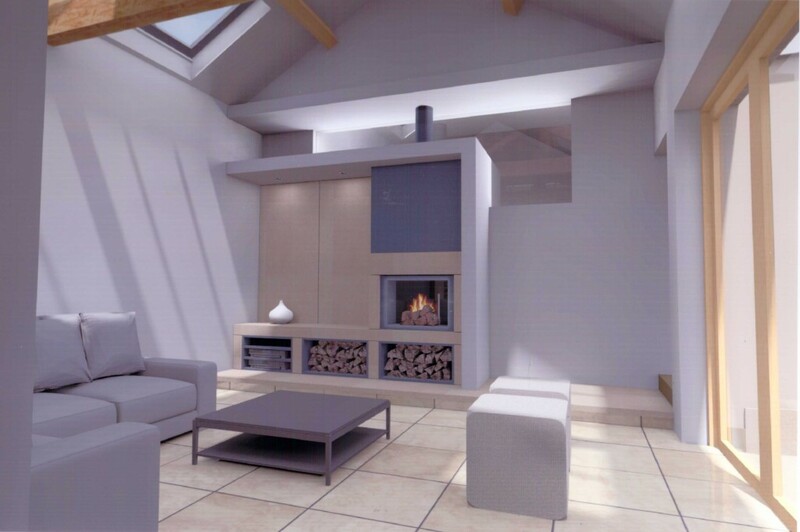 We need to build the chimney breast around the fireplace. This will be done using the metal framework that we have used elsehwere during dri-lining. 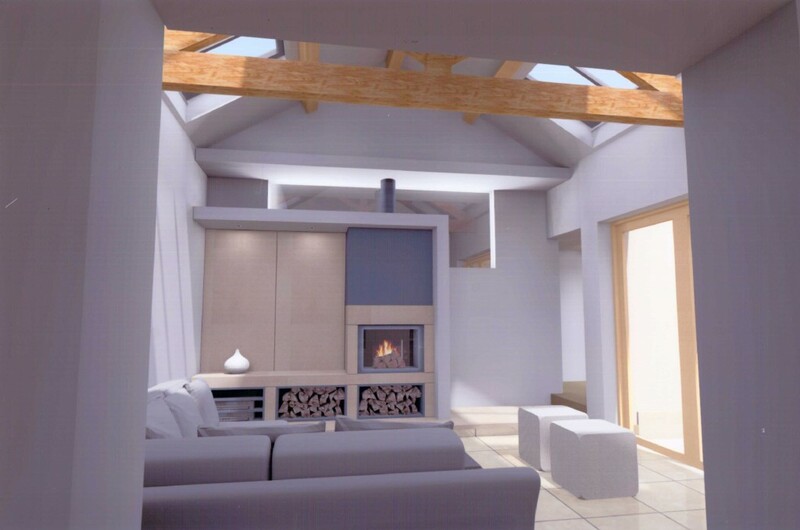 We will then board this with fireboard – a sort of plasterboard that has increased heat resistance. At the moment, this still ins’t looking like the finished product. We now have the ashlar stone work in place for the fire place. There are three stone “boxes” under the fireplace. 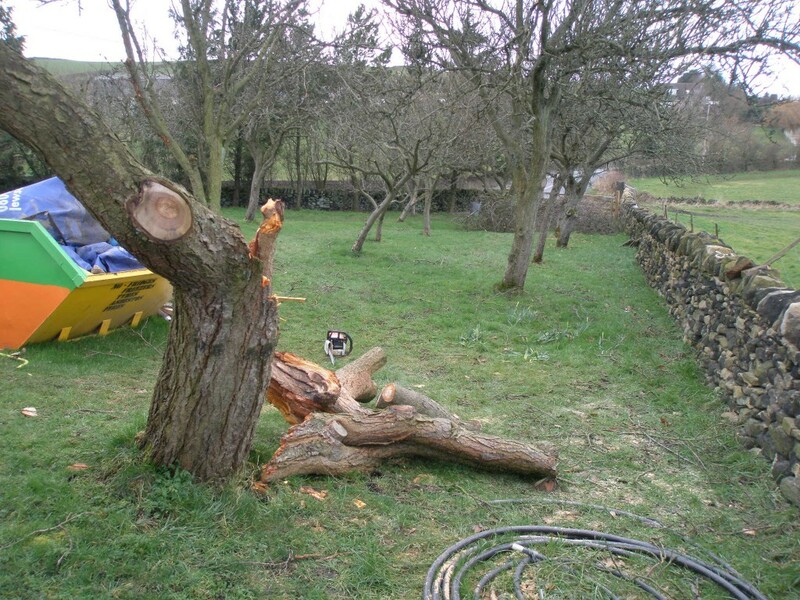 Two will be for logs and the third (the one on the far left) has cabling for a TV/HiFi. I am just not sure that if a TV/HiFi was placed here whether it would melt from the heat from the fireplace! The missing part for the Spartherm unit turned up yesterday and the installation was finished today. The good news is that the unit looks great. 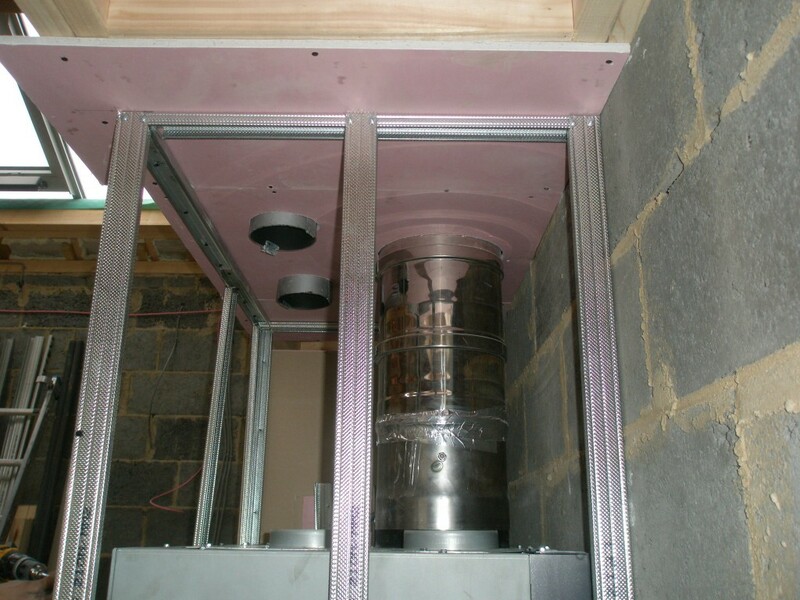 The bad news is that the flue on the outside looks like something that belongs on a fast food takeaway! This is hugely disappointing. After all the time and effort that went in to ensure the view of the building from the sunken garden looked great, we now have a large stainless steel flue protruding over the ridge line of the building. This is not what we had intended. Apparently, the flue needs to be 3m higher than the top of the fire box. Otherwise, we would have lowered it below the ridge line. In terms of colour, we could have got a powder coated flue (we only needed the top that sticks out of the roof), but no one told me this when we were sorting this out. And it is big, the flue is 7 inches across with a large stainless steel “hat” on the top. We will be looking into alternatives here as this doesn’t look great. Ho hum! 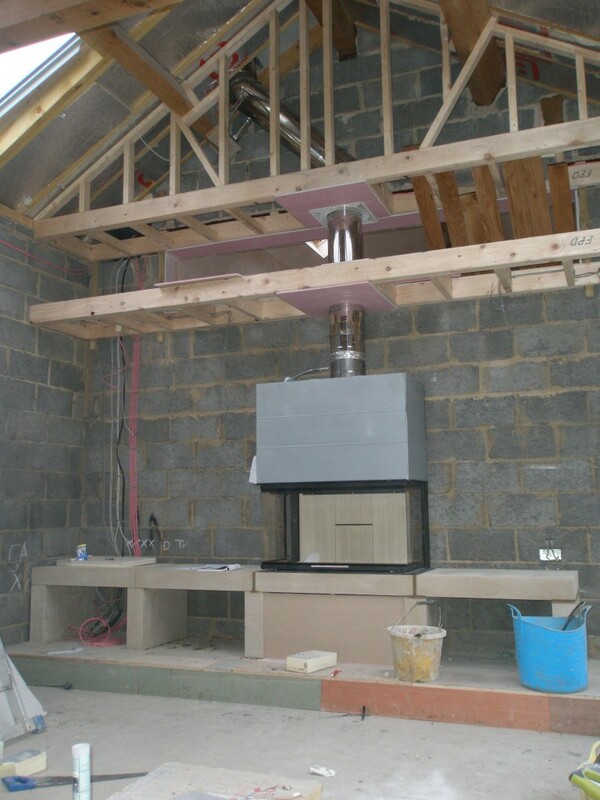 The Spartherm unit is now installed, although the chimney breasy still needs to be formed around it. The studwork that meets the roof line is there to mask the fact that the flue has a “dog leg” to avoid the large ridge beam. This is a big flue – 8 inches in diameter. 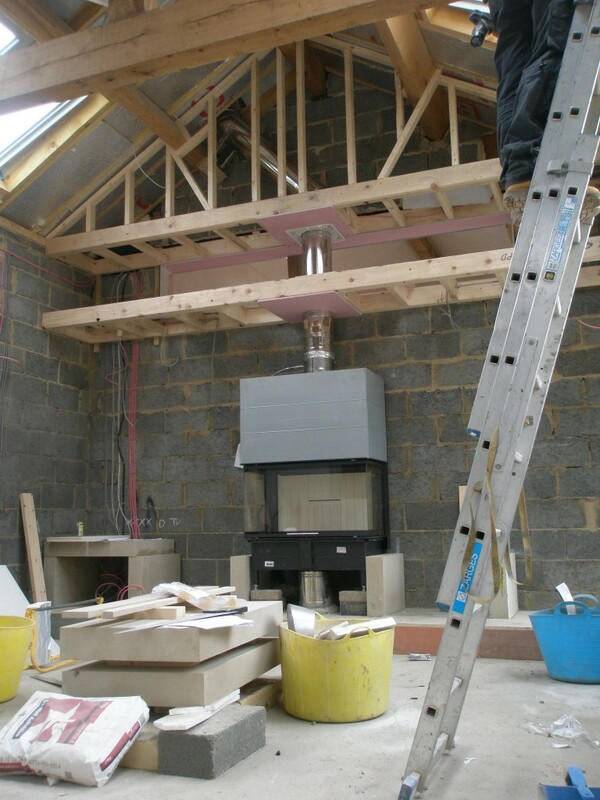 This is the rear elevation of the new extension and shows where the new flue appears through the roof. 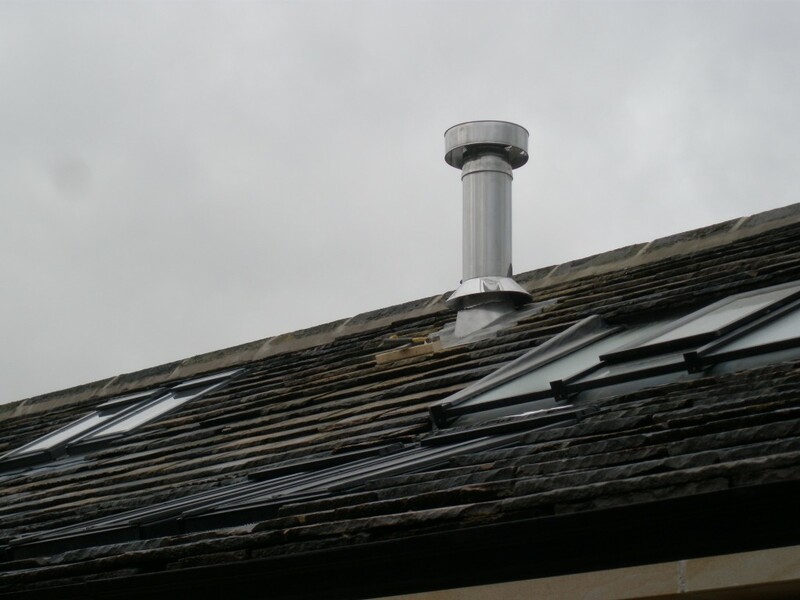 This is a lead liner that covers where the chimney meets the roof. The intention was that the flue would only ever be seen from the rear elevation. 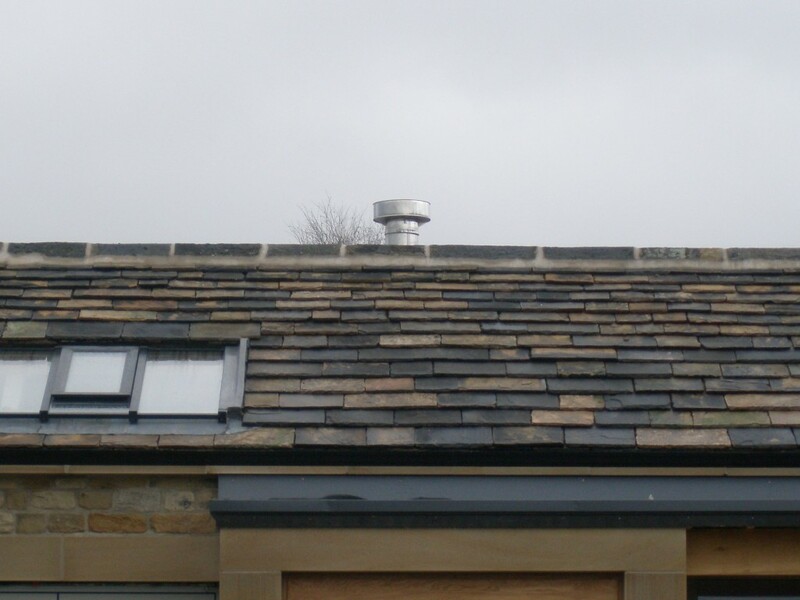 We were hoping that the new flue would not be seen from the new elevation. However, this is not the case. It really isn’t in keeping with the rest of the building. Mmmmm….this looks as if it would be more at home of the side of a chip shop! We are going to have to look at some alternatives here. I think reducing the height might improve it . Or painting it. Or making the top part smaller. 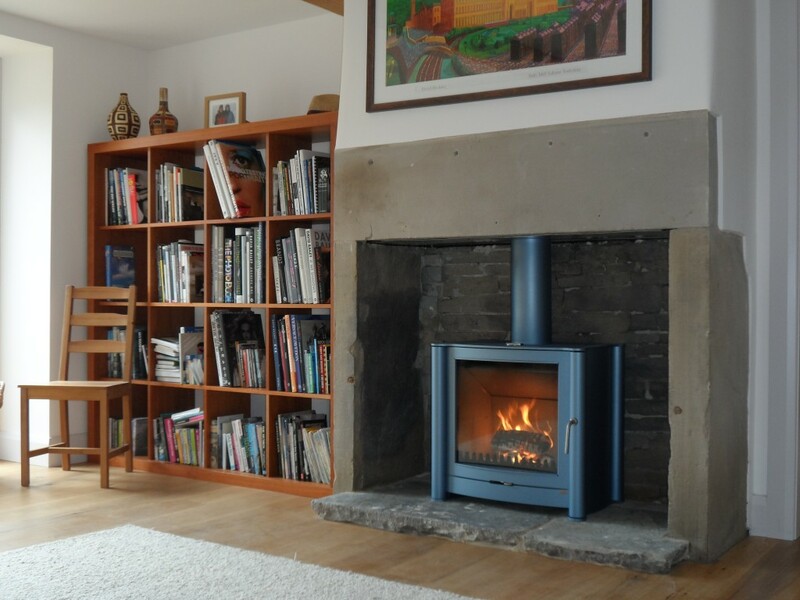 Although we are still missing a crucial part for the Spartherm unit, we have taken the time to get the Firebelly stove that we bought a few months ago installed. It is a FB1 stove in pewter with a matching stove pipe. Other colours are available. 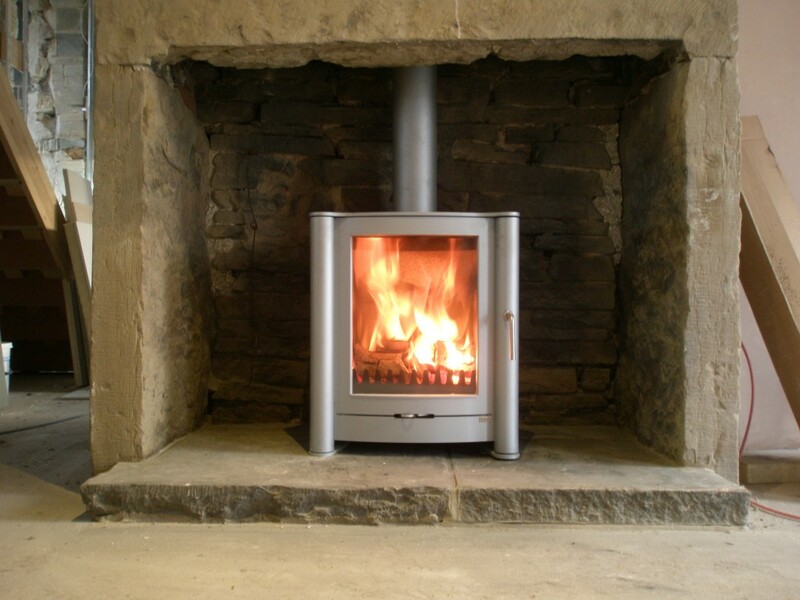 These stoves are made in Elland (just outside Halifax), so are very local to us. You will find more information here. 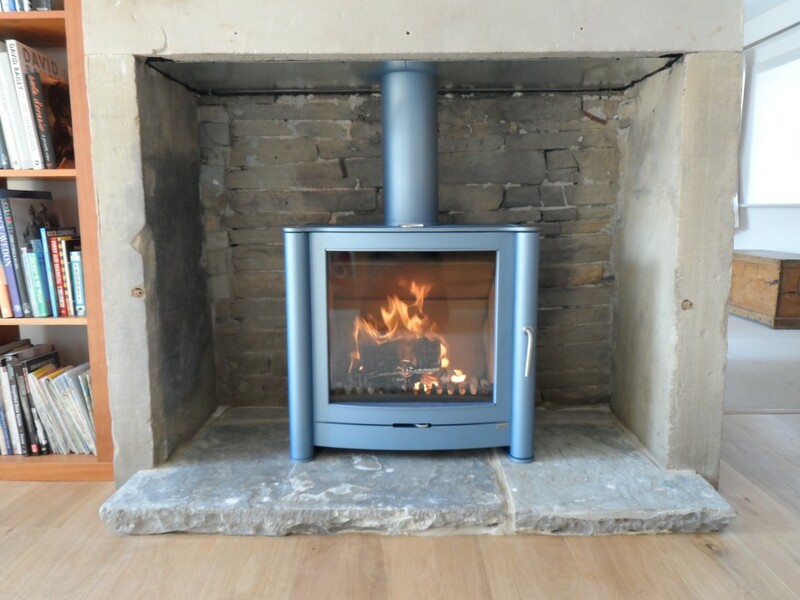 The stove is exceptionally well made and we are really pleased with it. The glass front provides a great view onto the logs inside. It burns very cleanly and the glass stays clean while in use, even when the air supply is turned down to slow the burn rate. It is easy to light and the combustion seems super efficient leaving the minimum of ash. While we are still missing a crucial part of the Sparthem unit, we have installed the Firebelly stove in the snug. 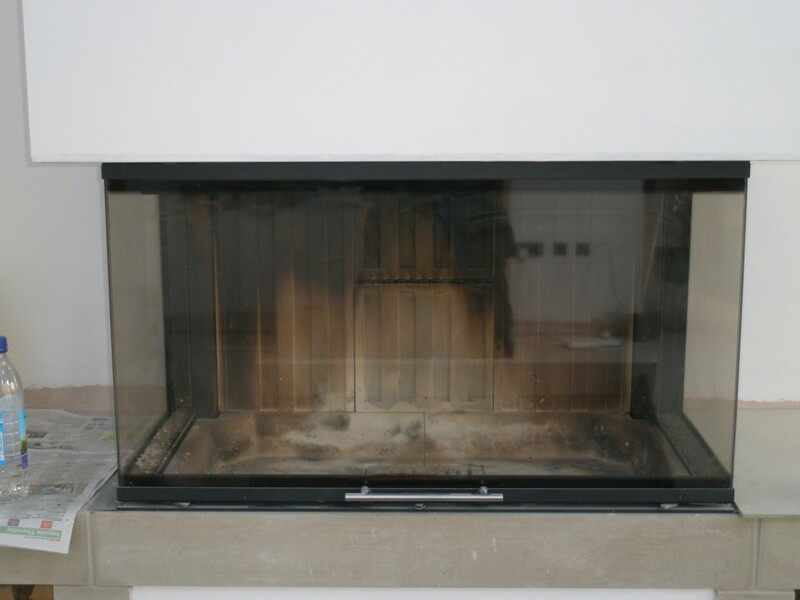 I am really impressed with this unit – it is easy to light, the glass keeps clean and it pumps out the heat. It is a big hit with the builders! The firebox for the lounge arrived yesterday. 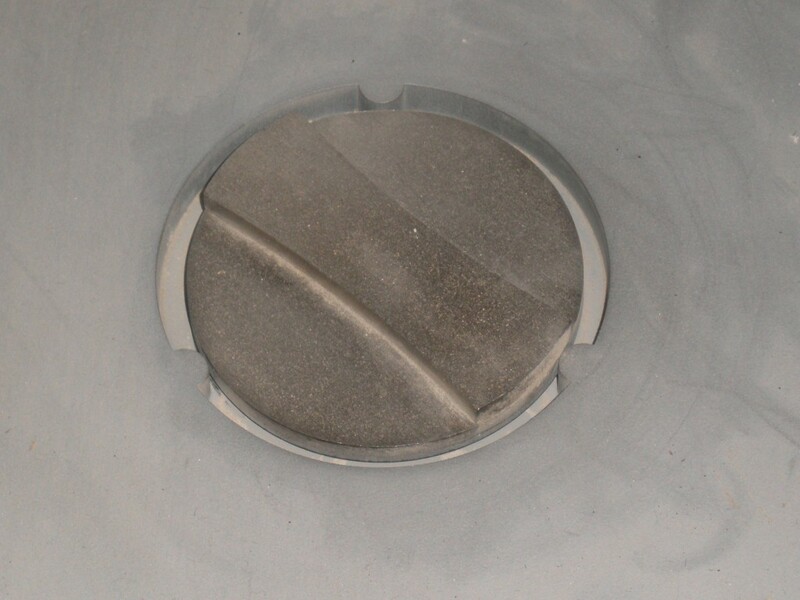 We have a slight problem in that the baffle (butterfly) for the flue seems to be missing. 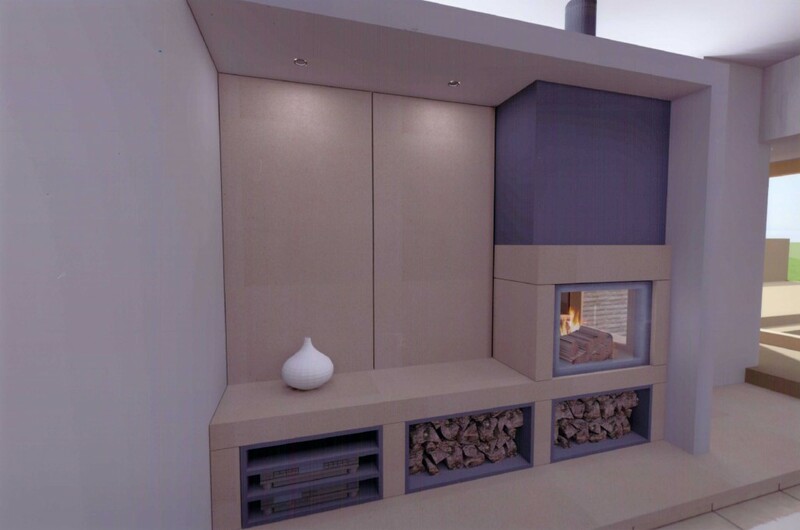 However, we should be able to get the unit into position and build the stone fireplace around it. 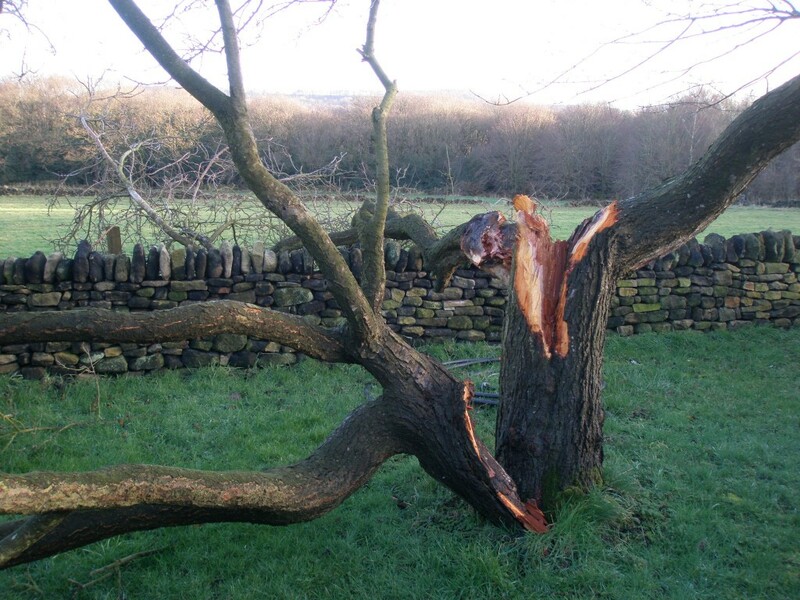 There will be some “fine tuning” required, but nothing that the builder can’t deal with. The design of the fireplace is covered here. However, re-looking at the pictures, we have significantly changed the design – we are now using a firebox with 3 sides of glass rather than 2. We have also gone for a design that is a little more symmetrical. 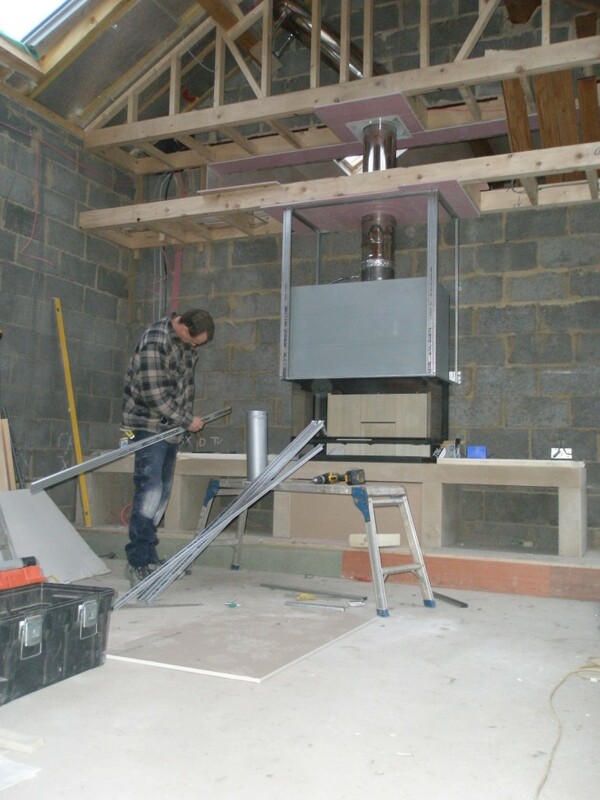 We are going to have to wait for the missing flue part before using it, however, we can get on with the job of installing it into the fireplace. 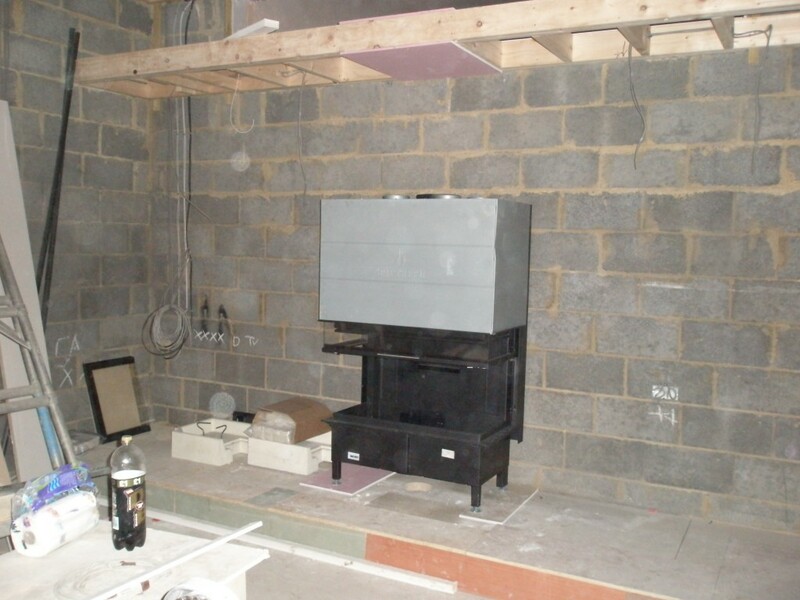 The installers are also going to install the Firebelly stove that we bought a few months ago. So although the Spartherm unit might not be operational this weekend, the Firebelly should be! It doesn’t look very impressive, does it? 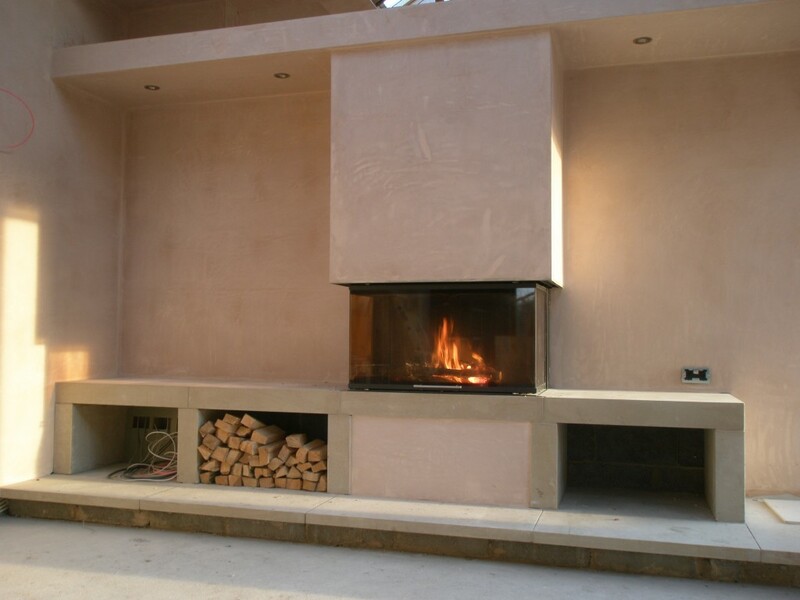 But over the next few days the fire place will be built around this Spartherm fire box. This is an Arte 3RL 100h (if anyone is interested!). It weighs in at a massive 300kgs! And here is what the firebox looks like once it is in position!